Face it, everybody loves Gershwin. A reminder you need? How about, “Bess you is my woman”? Or what about “Rhapsody in Blue”? Yes, we’ve all heard that from our childhood. Surely, I’m right. Or “An American in Paris”? I recall that melody from the early 1950s movie of the same title. My favorite dancer Gene Kelly starred that movie. The Fort Wayne Philharmonic’s performance Saturday at the historic Embassy in Fort Wayne virtually sold out. Fortunately, we ordered our tickets early. Our seats were on the main floor and not that far back from the stage. Gershwin. As American as apple pie, of course. But almost patriotic without the smaltz. Saturday’s performance was doubly special. 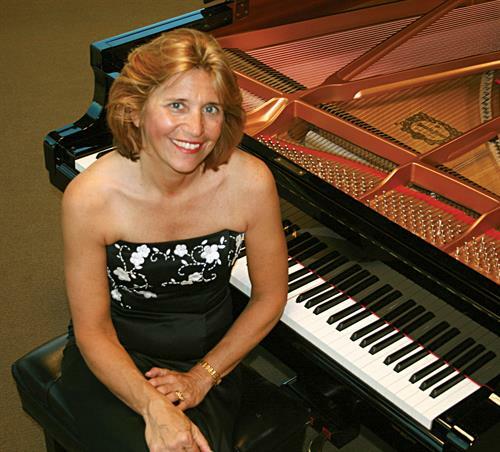 Sometimes Fort Wayne resident Jodie DeSalvo performed “Rhapsody in Blue” at the piano. So without apology, we claim this incredible talent as our own. The program not only tells of her national and international tours. But it also mentions her brilliance as a conductor. So of course, we claim her as our own. The program mentions that she gives tribute concerts in honor of the genius of pianist/comedian Victor Borge. Well, reading about that connection to DeSalvo sure took me back to the days of black and white TV when Borge had a weekly show. Her performance was so strong, so confident and so seemingly perfect, it’s no surprise that she’s so in demand internationally. After the concert, I found this genius where she had positioned herself at a desk to sell CDs of her performances. What I noticed was how gracious she was as she chatted with the concert-goers. I should mention the conductor for Saturday’s concert. Her name was Chia-Hsuan Lin. She’s originally from Taiwan, educated in the States – including the University of Cincinnati where a friend of mine taught musicology. This young woman was another star of the show. She moves with the command and energy of soccer star. Like DeSalvo, Chia-Hsuan has performed to international audiences. If she weighs 90 pounds I’d be surprised. As I reflect on the concert, I’m reminded once more of the seemingly infinite range of talent human beings can deploy. A big part of it with artists like DeSalvo and Chia-Hsuan is inherited. A gift from parents and past generations. When you read the biographies you often find fathers and mothers who also performed and even were renowned during their careers. Once, on a fellowship, I spent a couple of weeks visiting classes and tutors at Indiana University’s famous School of Music. The students in violin and cello only got admitted to the school because they had demonstrated a gift. But as I recall, every professor reported that the most important thing wasn’t the student’s gift. It was practice. The practice is what people like DeSalvo do for themselves and their careers. Their endless hours of practice is also the gift they give to the rest of us. No wonder for days, maybe weeks, the Gershwin tunes will be running through my mind. What a gift! Next Next post: Winter be gone!